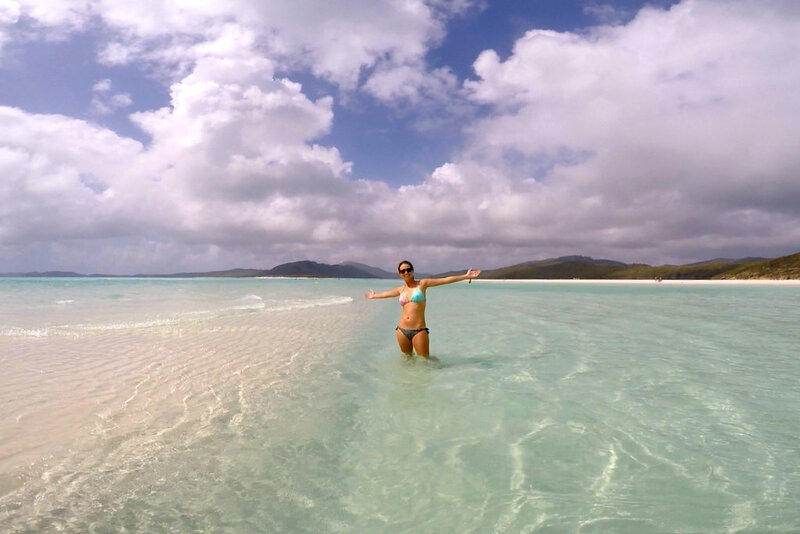 The Whitsunday are a group of little islands off the coast of central Queensland, and are technically part of the Great Barrier Reef. 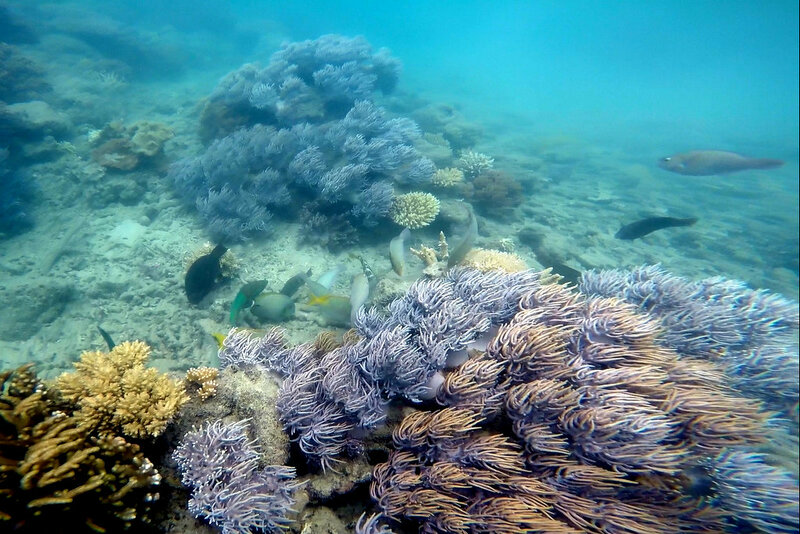 The main attraction here is sailing, “beaching” and snorkeling, rather than full-on diving (which is better further north, off Cairns). 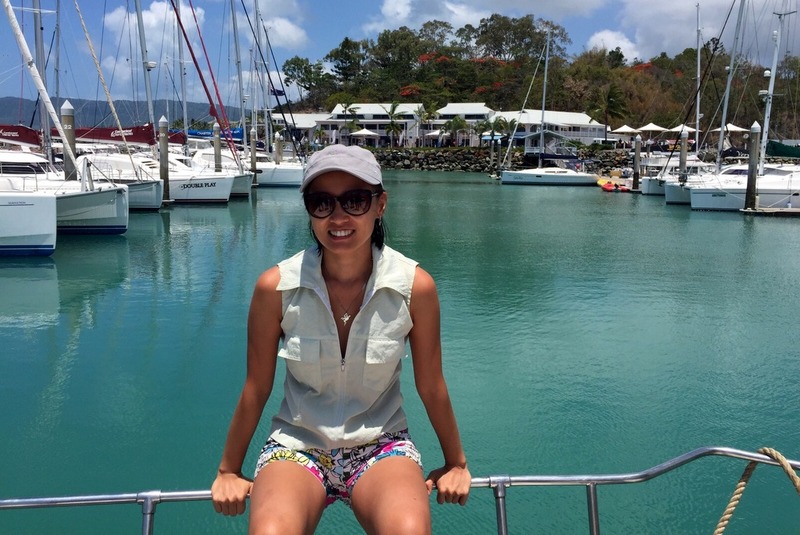 Although you could fly directly into Hamilton Island and stay in one of the resorts there, most backpackers fly into Proserpine, and stay in the coastal town of Airlie Beach, where they join a sailing tour. There are a ton of operators with very different prices for 1, 2 or 3 day tours, so if you have the time and patience, I recommend you do your research. 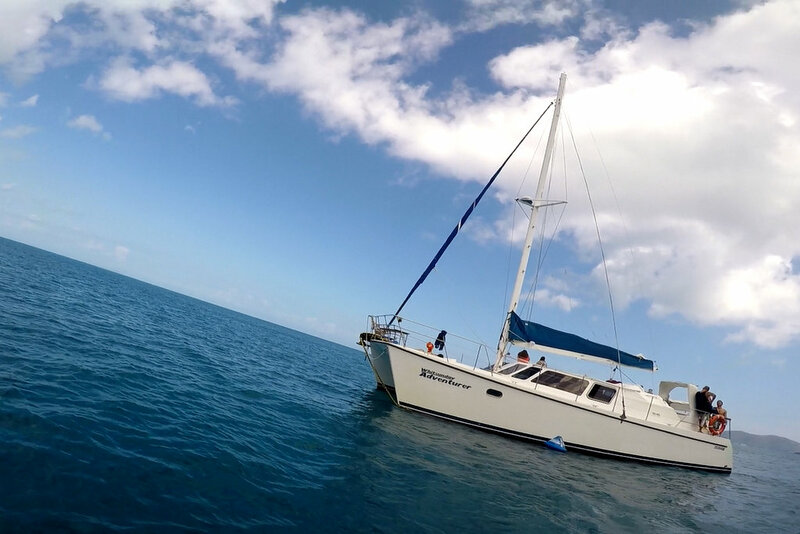 All the options include similar time in Whitehaven, and the differences are really the rest of activities and the type of boat. 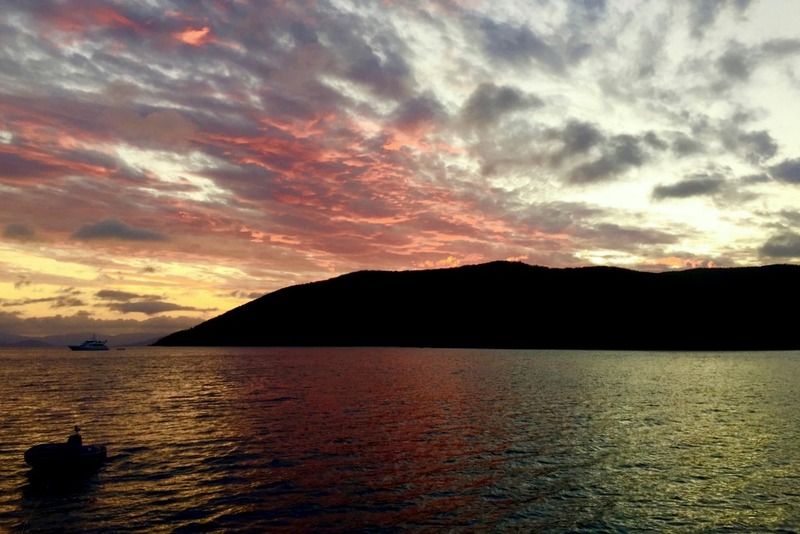 We opted for a 2 day 2 night sailing trip, because we wanted to enjoy the bliss of sailing (the daytrips are on speedboats)… but having sailed in French Polynesia a few months earlier, thought we would get uninterested quickly. 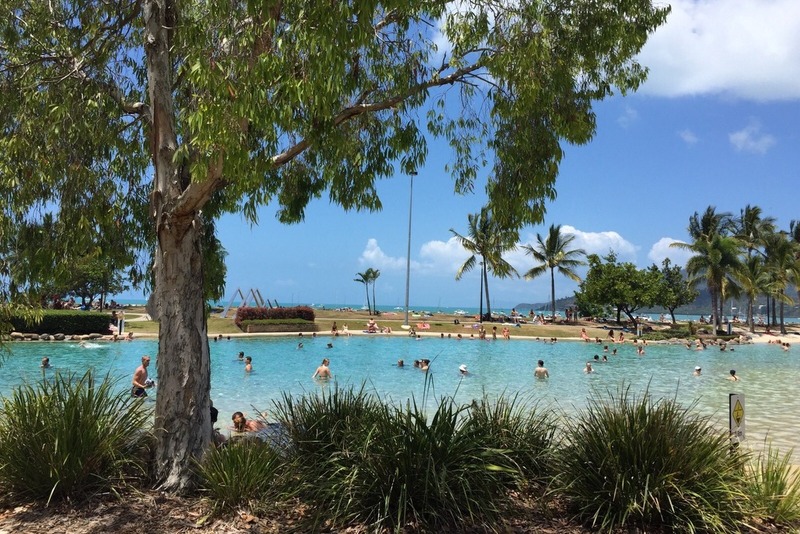 So we landed in Proserpine, took the shuttle bus to Airlie Beach, and checked-in at the tour operator office, where we were able to store our bags. We had a couple of hours before we had to embark, and we spent them picnicking on the beach, avoiding drunk youngsters (apparently Airlie is a big destination for Schoolies, a sort of Spring Break for Australian high school graduates), and slowly making our way to the harbor over a nice shore walkway. 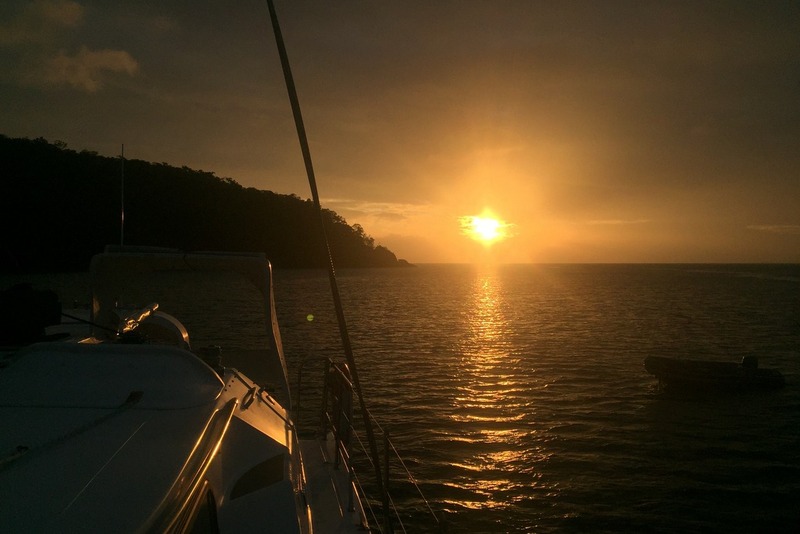 We boarded our boat, a 40-ft or so catamaran, and met the captain and first mate, two middle-age, humorous Aussies. Our accommodation was simple, mainly bunk beds in open areas, but it always felt homey, probably due to the abundance of food at all times 😉 We got on our way and started to enjoy the beautiful ocean and soon after, a perfect island sunset. And we even got to practice a man overboard drill, when my hat was taken by wind! The next morning we reached Whitehaven after breakfast, disembarking with a dinghy on the opposite side of the inlet. We walked across the forest, until we reached an opening and saw in front of us a massive extension of perfect white sand… Wow. 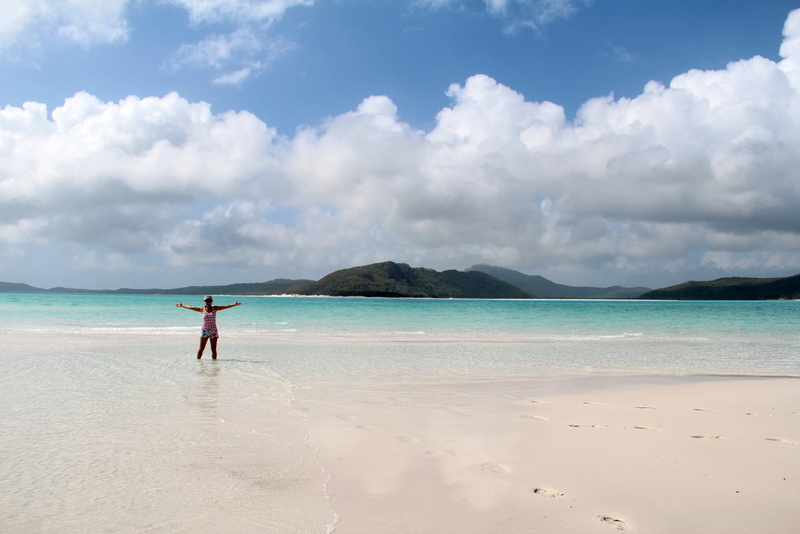 The sand in Whitehaven is 98% pure silica, making it indeed the whitest in the world, and it is so thin, that you can hear it squeak under your feet when you walk. The water, which we were starting to run toward, competes with the sand for attention and accolades. It’s turquoise and clear, and when the sun is out, nothing short of perfect. During certain months, you are supposed to wear sting suits when you get in, but the water was so inviting and the temperature was so perfect, that we took them off. 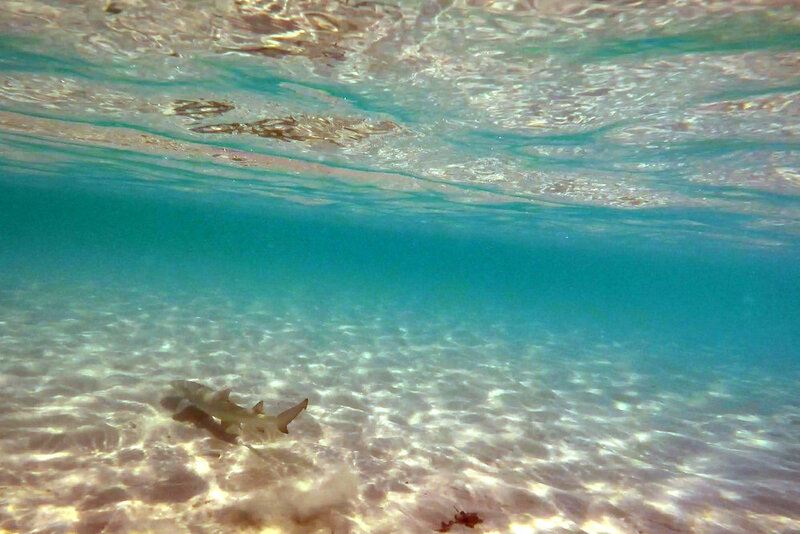 We walked around the beach and in the water, taking pictures from all possible angles. It was actually too shallow to swim, but we ran, and jumped, and splashed, enjoying like kids. 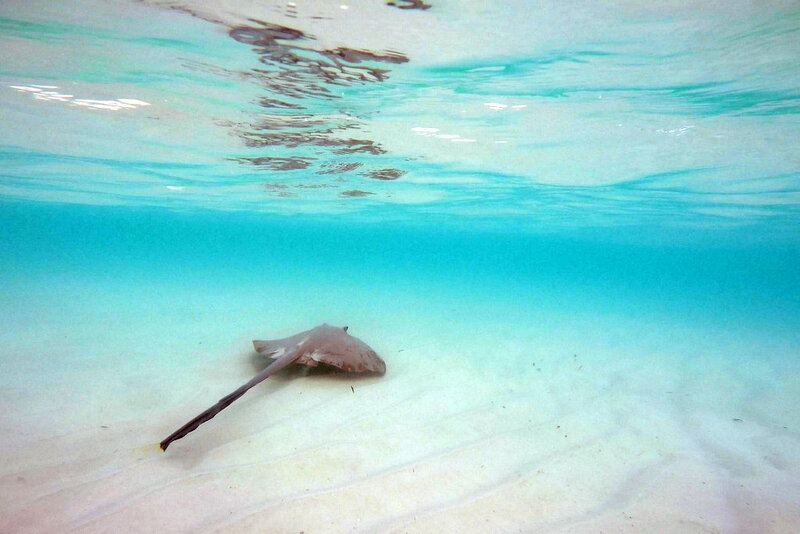 We spotted and chased a bunch of stingrays, and even a baby shark. They are fairly common in the sheltered, shallow waters of Whitehaven, and the water is so clear that you can observe them perfectly. 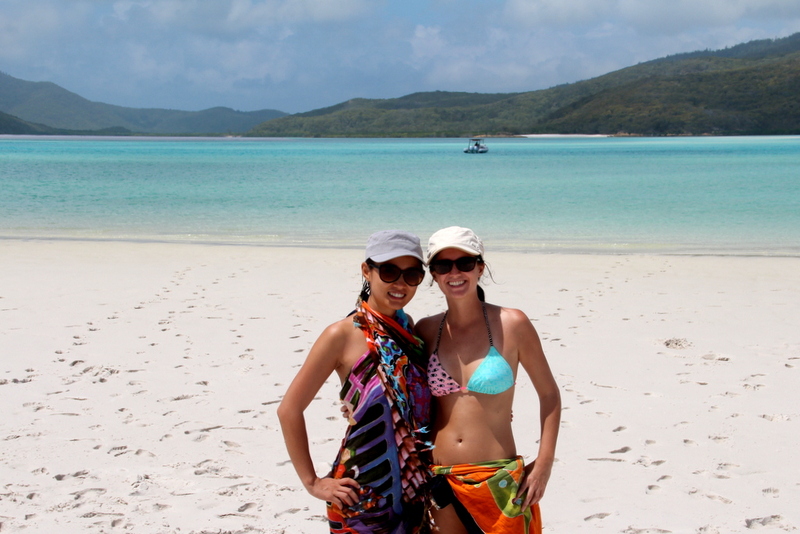 We could have spent the whole day there, but had to hurry up to check out the other highlight of Whitehaven before our boat would leave. The Hill Inlet Lookout was at the end of a 20 min bushwalk along boardwalks. And the views were stunning. 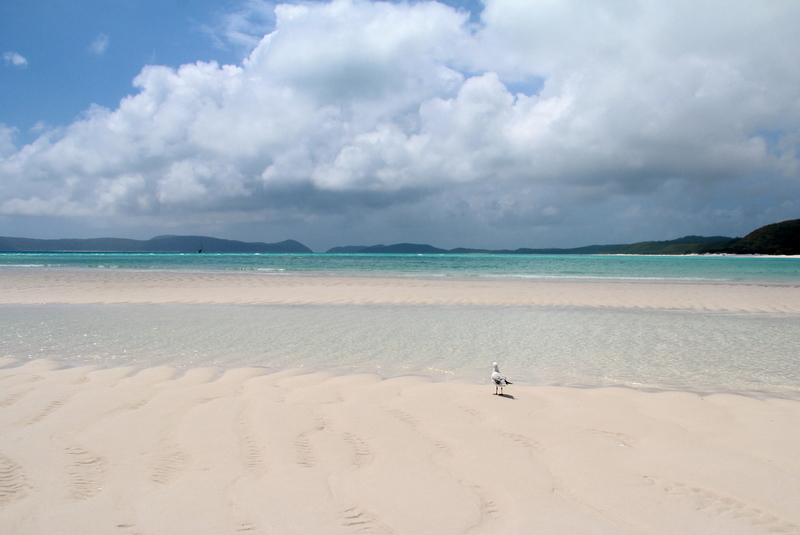 At low tide, more and more white sand was getting exposed, forming impossible swirls against the aquamarine water. The beach we had been on seemed to separate this water from the more azure one, creating a spectacular contrast. And the dark green islands completed the postcard picture. We were in awe and couldn’t stop grinning. After another photoshoot, we ran back down the hill. Not only because we were late, also because our feet were burning. Our captain had forgotten our shoes (you always take them off when you board the boat) and the boardwalk was scorching under the sun… learn from our mistake, make sure you have your shoes! And since you won’t be in pain, make sure to walk a bit further beyond the main viewpoint to enjoy the sight in peace; most travelers pile up on that one spot and then turn around. Back on the boat, we gobbled lunch (I always feel extremely hungry after the beach), and went for a quite good snorkel. The coral was colorful, visibility was good and there were some big bat and parrot fish. And then we witnessed another amazing ocean sunset. The next morning, there was time for another snorkel and some water sports. Elena and I decided to try the stand-up paddle boards, which we had avoided the previous day because our boat mates made it look so hard. Luckily, we were naturals, got up easily and didn’t fall! It was fun but really exhausting. So we switched to the glass-bottom kayak that was also free to use on our boat. All in all, it was a great tour, and we felt sad when we got back to the Airlie wharf and said goodbye to the crew and other travelers. 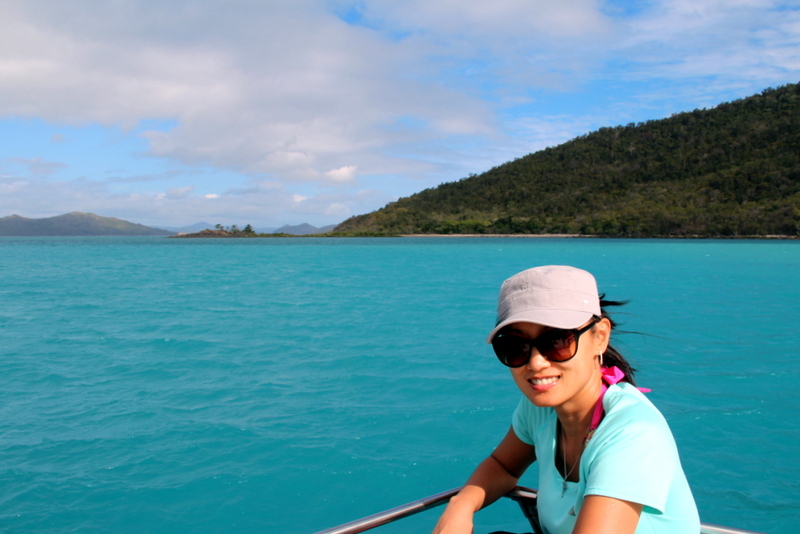 But our visit to the Whitsundays wasn’t over yet. That afternoon we relaxed at the cool man-made lagoon, and took a pleasant night walk to the marina and along the endless restaurants and bars in the town center. 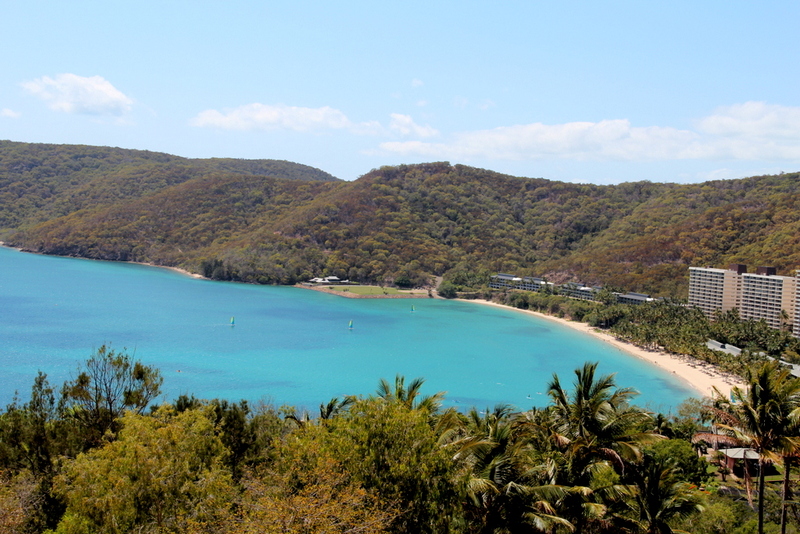 And after a crazy night when I had to deal with a work-related fire, and a one hour ferry, we left Airlie Beach and made it to Hamilton Island. We hadn’t actually planned to do anything in Hamilton, we were just coming here because our fly out to Cairns was from this airport instead of Proserpine. And I’m so happy we came, it was one of those unexpectedly awesome travel days. 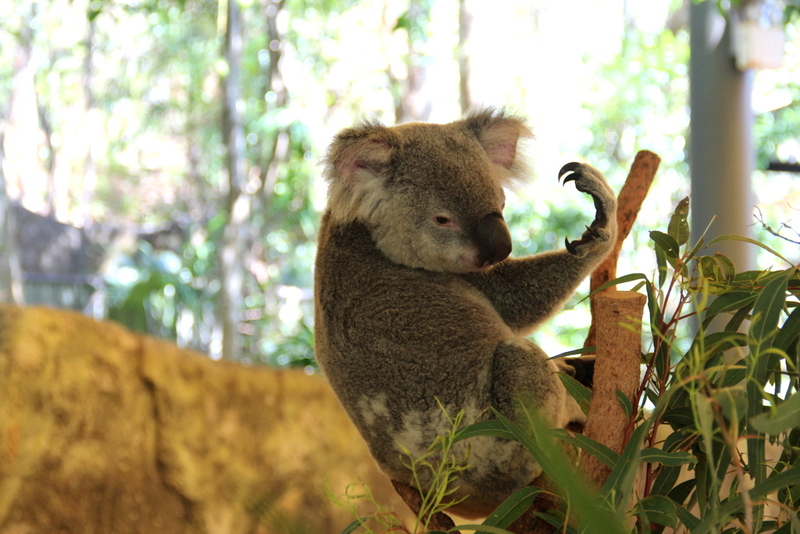 We were strolling around with our backpacks, and randomly saw a koala, hanging out at the entrance of what seemed to be a mini-zoo. The following day, we would have our koala cuddling experience, but this was our first one in Australia (short after our kangaroo encounter in the Red Center) and it was exciting. Then we stumbled upon some tourist info, pointing out some lookouts. We set to the nearest one, One Tree Hill, but soon realized that it was too far and steep for us to hike up with up with our backpacks under the sun. 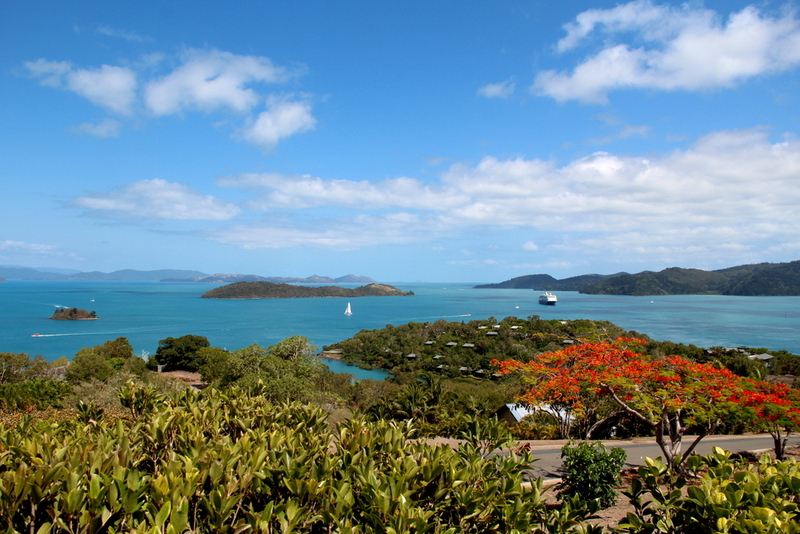 Hamilton Island doesn’t have cars, let alone taxis, and resort staff and tourists move around in gold carts. So we tried to hitchhike one of those… and got picked up in no time. The panorama from up the hill was fantastic, 180 degrees of deep blue ocean cut by lush islands and occasional ships. From there, we walked down a bit to another great vantage point, this one overlooking Hamilton Beach. 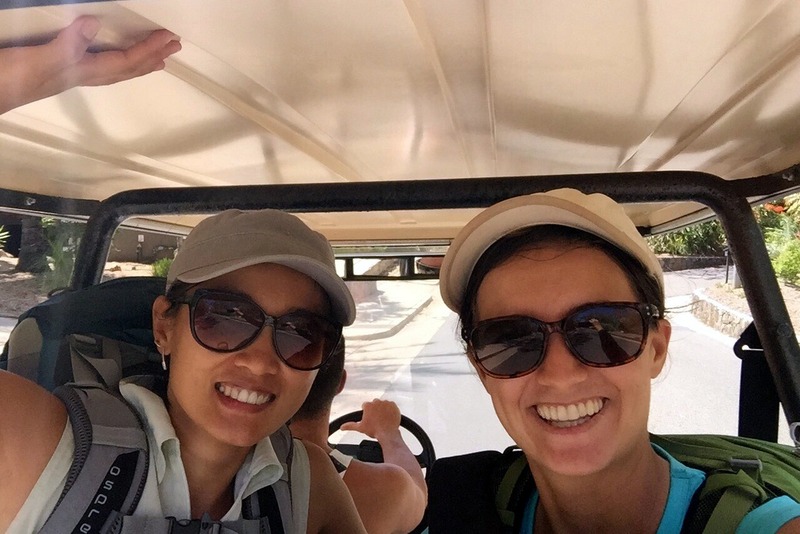 And then we hitchhiked again to get down to the beach itself, where we relaxed in the hotel lounge chairs until it was time to hitchhike one last time to get to the airport. Oh, Australian people are so nice! 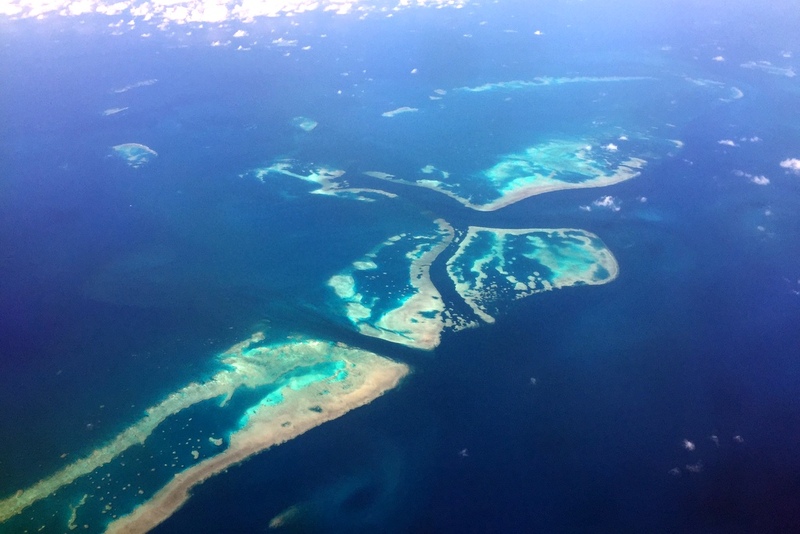 The flight to Cairns was far from uneventful, it was probably the most scenic I’ve had. 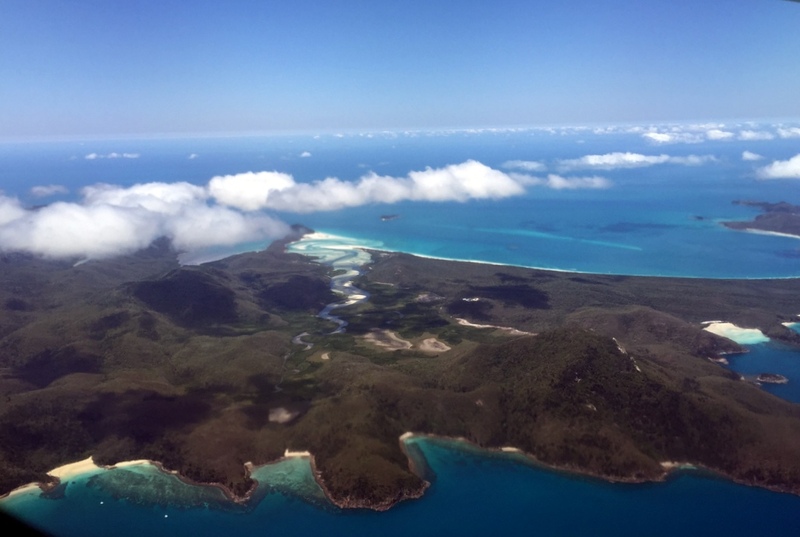 We spotted Whitehaven, unmissable among all the other pristine yet smaller beaches, and drooled in anticipation of our upcoming liveaboard when we saw sections of the Great Barrier Reef.